Capturing live videos and still images and sending them to local computer or computer and other devices attached to the Internet. Pan/Tilt/Zoom (PTZ) with digital zoom. recording and up-loading surveillance videos to computers, smart phones, or PDAs attached to the Internet. Initial Installation – Static IP address assignment, access security, Wi-Fi parameters, Email setup, FTP upload host, dynamic DNS, and remote control. Network Configuration – Wireless security parameters, port forwarding, MAC filtering, and firewall configuration changes. 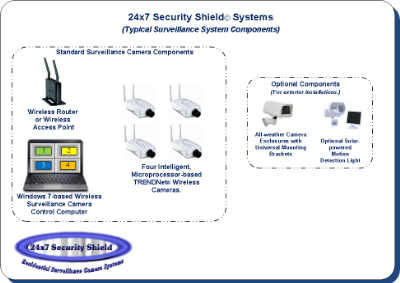 On-going Support – 24/7 technical support for all surveillance camera components including routers and wireless access points..
View surveillance camera videos on local computers, and/or computers, smartphones, or PDAs attached to the Internet. Use one of your existing computers as surveillance camera control systems. Record videos at a specific day and time, or every day of the week at a specific time of the day. See who entered or attempted to enter your business when you were closed. Maintain an surveillance database/archive of all attempted intrusions or other suspicious activities. Use your existing broadband modems and/or cable modem to provide Internet access to your cameras. Perform all Internet camera administrative/control functions both locally and across the Internet. 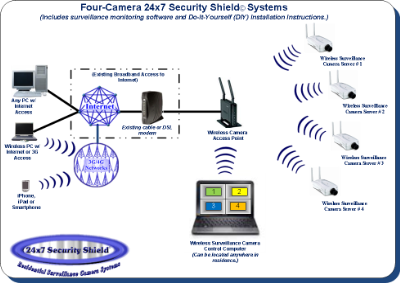 Provide remote access to Internet camera systems without a static IP address. 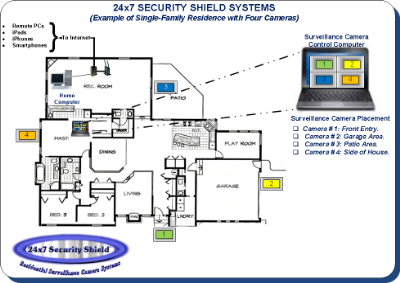 Your IP surveillance camera system can provide a surveillance shield that will help protect your residence or small business. If you need more information, please click Here or call (602) 478-4778 or (623) 979-5934.